So writes Steve Hassett in edited excerpts from an article* posted on Seeking Alpha entitled Dow Hits Record High But Risk Premium Factor Model Shows Market Still Undervalued. The RPF Model is a simple approach for understanding intrinsic value of the market. The model shows that two factors drive the market, earnings and long-term interest rates, which drive cost of capital and embody inflation and, for individual companies, a third factor: growth. The RPF Model shows for a given level of earnings and long-term interest rates whether the market is over or undervalued. This series of articles provides periodic updates to compare predicted to actual based on the latest earnings, interest rates and actual S&P 500 Index values. I’ve written about the model numerous times, so rather than repeat my overview of the model, you can read about it on Seeking Alpha. 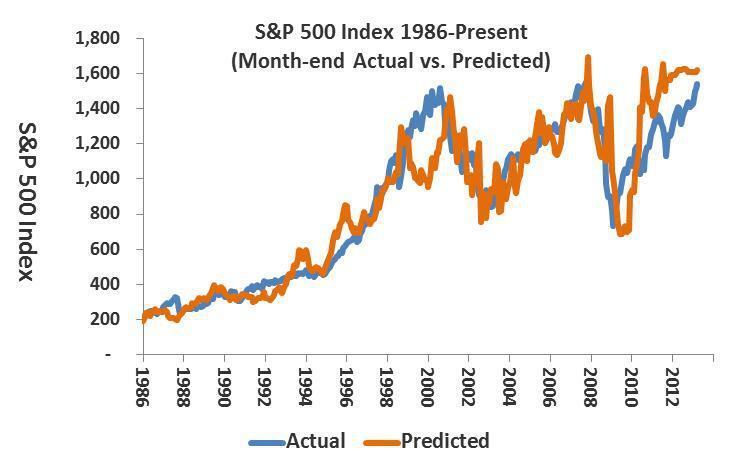 The chart below shows actual versus values predicted by the RPF Model for the S&P 500 since 1986. (click to enlarge) The chart uses normalized yields on 30-year Treasuries of 4.5% (2% real plus 2.5% inflation) from August 2011 through the present to adjust for the Federal Reserve’s artificially depressing long-term rates by keeping short-term rates near zero. [One can conclude from the above chart] that if you expect earnings to hold at the current level or increase in the coming year, the market is undervalued. Today, the model shows that, with a normalized yield on 30-year Treasuries of 4.5% and using S&P’s trailing twelve month estimated earnings of $98.30, the intrinsic value of the index is 1,622 [or] 5.3% above March 5, 2013 close of 1,540. Since the model shows that stock prices move inversely to long-term Treasury yields, using the actual 3.10% yield on the 30-year, would result an even higher predicted price for the S&P 500. Some argue that the market is overvalued. The potential validity of their argument is dependent on the underlying reasoning. Those that suggest the market is overvalued because fundamental economic problems such as deficit, increased tax rates or reduced government spending could hurt earnings are making their case based on fundamental principles: if the economy weakens and earnings fall, the market should follow; if inflation increases stock P/E ratios should fall. Others make a naive argument that the market is overvalued simply because it has increased and hit a new high, so it is due for a correction. Of course the market could decline, not simply because it has increased, …[but because] the fundamentals of earnings and interest rates [have changed]….I advise tuning out those voices and paying attention to the drivers of the market rather than its momentum. Over the long term it has shown to respond to interest rates and earnings. Focus on the drivers of those factors and develop a view on their direction, then use that to gauge the market. and, indeed, the gap has been closing as equity prices have increased [and would appear to have another 5.3% or more to go to achieve parity].. Recipients restricted to only 1,000 active subscribers! 1. Will It Be Different This Time? Will the Dow and S&P 500 Go Up, UP and Awaaay? 9. Don’t Ignore This Fact: “Greedometer Gauge” Signals S&P 500 Drop to the 500s by July-August, 2013! 12. I’m “making the call” for a market correction of 50% – or more!! 17. Stop! Don’t Forget Market Risk – Remember What Happened in 2000 & 2007/8. 20. Ignore Wall Street Cheerleaders: Market Technicals, Fundamentals & Other Info Says Otherwise! 25. Will a Black Swan Event Cause the S&P 500 to Drop by 40%? Next I’m “making the call” for a market correction of 50% – or more! !